Last week I worked on the Art Department for a new reality show that is set to come out sometime in 2009. I'll keep ya'll posted on when it's gonna' be on TV. As of today the INTO THE WOODS DVD is in the reviewing stages. The cover artwork for both the DVD and the CD Soundtrack have been completed and are ready to roll. 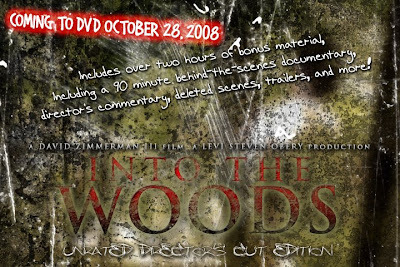 The official release date for the INTO THE WOODS DVD and Motion Picture Soundtrack is OCTOBER 28, 2008. Just in time for Halloween! MAX THE KING, whom contributed the song "Branded" to INTO THE WOODS has a new EP available at his MYSPACE page here. The 13th Street Flicks DVD is coming along well also. It is coming together better than expected and will be a honorable end to the trilogy. I also hope to have some sort of cover artwork that will house the entire collection completed soon. That's all I got for now...Good day.